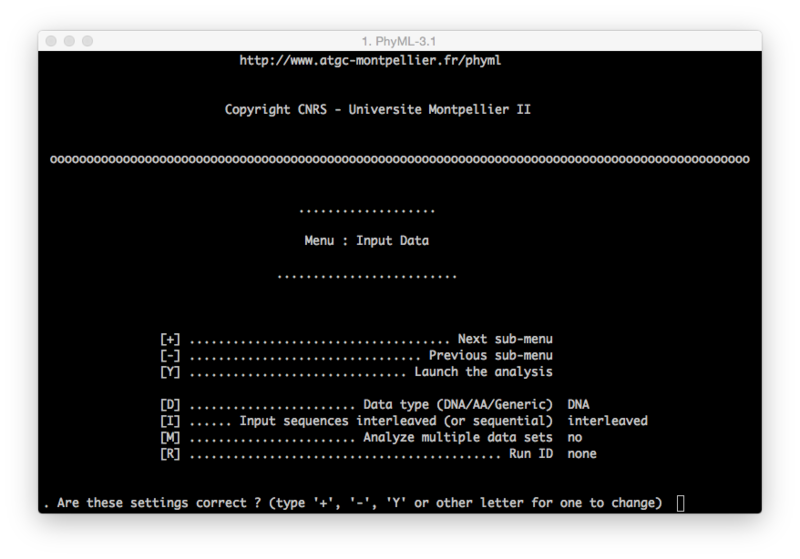 PhyML runs without a graphical user interface (GUI). Therefore, you will see a black terminal window appearing on your monitor anytime you execute it. WARN: On Windows machines PhyML will close automatically the terminal session at the end of the execution. dragging PhyML-3.1_your-operative-system (i.e. PhyML-3.1_linux64) into a new terminal session (on OsX and Linux operative systems search for Terminal). (WARN: remember the difference between interleaved and sequential files). You can move between menus using the + and - key on your keyboard and pressing enter to confirm the command. The same procedure applies for all the other commands. Command Line: this interface allows the user to set all the configuration parameters in one single step, dynamically but not interactively.